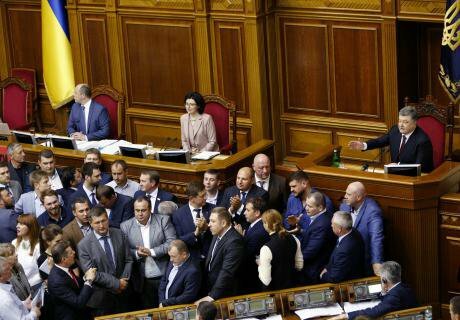 Ukraine’s Verkhovna Rada: an oligarchs’ club or a real parliament? May 2016: Ukrainian president Petro Poroshenko speaks while Ukraine's Radical Party and Poroshenko Bloc Party block the rostrum during appointment of new prosecutor general. (c) Sergei Chuzavkov / AP / Press Association Images. All rights reserved.The debating chamber of the Ukrainian parliament, with its glass dome and Soviet-era frescoes on the ceiling, is Europe’s biggest business club. To become members of this exclusive establishment, many people are prepared to pay up to five million dollars, either in bribes to a party leader or to buy votes in their constituency. At first glance, the parliamentary deputies’ workplaces are reminiscent of pews in a Catholic church. But this resemblance is deceptive. Each deputy has three different coloured buttons to use when voting, a narrow table and a chair covered in burgundy coloured velvet. These seats may look comfortable, but are, in fact, as hard as a wooden bench: their synthetic foam has disintegrated from years of use and the velvet (also synthetic) is saturated with the sweat of several generations of Ukrainian politicians. The chamber is incredibly noisy — deputies don’t stay in their seats, they huddle together in groups of two or three, engaged in the latest bit of political horse-trading. Fights break out regularly: at the end of last year, one member of the president’s party pulled prime minister Arseniy Yatsenyuk from his seat and attempted to forcibly remove him from the rostrum. The PM stood there like a dummy until his party colleagues ran to his aid, and the result was a massive brawl. “There are a lot of morons in parliament,” Yatsenyuk commented shortly afterwards. Among those in the thick of the fight was Andriy Ivanchuk, a childhood friend of Yatsenyuk and one of a new generation of oligarchs in Ukrainian politics. Despite the 2014 Revolution of Dignity, also known as the Euromaidan, which ended with shootings in central Kyiv and the flight of corrupt and disgraced president Viktor Yanukovych to Russia, Ukraine’s billionaires remain keepers of Ukraine’s political Holy Grail. In West Virginia there are mines, worth a billion dollars, owned by Rinat Akhmetov, a Ukrainian oligarch with a Tatar name who was for many years Viktor Yanukovych’s closest associate. In 2008, Dmytro Firtash, another Yanukovych associate, was in negotiations to buy, also for $1bn, a piece of land in Manhattan, which he planned to build a 65-storey Bulgari tower. The deal broke down at the last moment, which was just as well for Firtash, as otherwise this asset would have been confiscated along with others belonging to the oligarch on the orders of a district judge in Illinois, where Firtash has been indicted on charges of alleged conspiracy. After the fall of the Yanukovych administration and EuroMaidan protests in 2014, the role of chief oligarch passed to Ihor Kolomoyskyi, who promptly became governor of the Dnipropetrovsk region. Here, he financed the creation of a local civil defence battalion and appointed his cronies to head the state-owned UkrTransNafta oil pipeline company. Kolomoiskyi’s 1+1 TV channel was also an important element in the propaganda war around the 2014 parliamentary elections. In spring 2015, Kolomoyskyi challenged the government when he refused to accept a change of leadership in UkrTransNafta and the partly state-owned UkrNafta oil and natural gas extraction company. The oligarch violated the president’s monopoly on the use of arms when he brought gunmen into UkrTransNafta and UkrNafta headquarters to defend his interests. The upshot of the standoff was that Kolomoyskyi lost his gubernatorial post and was forced to retreat for some time in Switzerland, where his family has lived for the last 20 years. 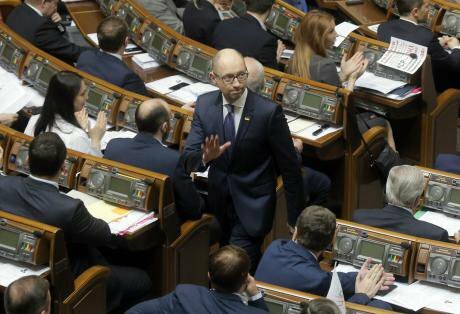 April 2016: Arseniy Yatsenyuk leaves the parliament's hall after his resignation. (c) Efrem Lukatsky / AP / Press Association Images. All rights reserved.All this changed, however, this spring, when president Petro Poroshenko finally succeeded in removing Arseny Yatseniuk’s administration from power. A lengthy government crisis ended with the appointment of Volodymyr Hroisman (who is loyal to Poroshenko) as prime minister, but it came at a high price. With the ruling coalition barely able to hold its majority, it was essential to find it some extra votes from somewhere, and they came in the form of two oligarchic fractions under the pleasant sounding names of Vozrozhdeniye (Renaissance) and Volya Naroda (The People’s Will) that became informal coalition members. This search for votes yielded a truce between Poroshenko and Kolomoyskyi’s oligarchic clan. The erstwhile Swiss exile used his parliamentary henchmen’s votes to support Hroisman’s appointment. It is even more telling that it was the votes of Kolomoiskyi’s deputies that gave Ukraine a new prosecutor general in the form of Yuri Lutsenko, who heads Poroshenko’s parliamentary fraction. Lutsenko has started work, replacing half of his deputies for representatives of civil society, but is yet to sack the public prosecutors accused of carrying out the orders of president Poroshenko. A new deal, or same old? All in all, by mid-2016, the de-oligarchisation promised by president Poroshenko one year ago has failed. Instead, Kolomoyskyi has become a fully-fledged participant in Ukraine’s political life. The former governor of Dnipropetrovsk region has started to appear in the presidential administration building of late. One of his demands is that the present head of the State Fiscal Service Roman Nasirov, regarded as the main anti-reform figure in the government, should remain in post. The government has also dropped its attempts to recover the almost $1bn owed by Kolomoyskyi to UkrNafta, which the company owes Ukraine’s treasury in its turn. The country’s National Bank has also agreed to restructure the repayment of a refinancing loan for Kolomoyskyi’s Privatbank. The second oligarchic group supporting Hroisman’s government consists of gas business owners who have a cooperation agreement with the state owned UkrGazDobycha gas extraction and production company. These took control of the company immediately after the Revolution of Dignity and succeeded in depositing its assets in a bank belonging to seven parliamentary deputies. A year ago, however, the company had a change of management, with reformers now in charge. Since the deputies’ fiefdom came under attack, the People’s Will parliamentary grouping hasn’t stopped trying to regain control of the company. After the People’s Will fraction supported Hroisman’s appointment, UkrGazDobycha’s headquarters was subjected to searches, which is seen as part of an attempt to replace the company’s current independent management with people more loyal to the oligarchs. The change of government has also brought an end to a run of bad luck for Rinat Akhmetov, former president Yanukovych’s closest political associate. From 1 March, Akhmetov’s power company DTEK has been able to raise electricity prices by 20%, and the cost price of coal to thermal power stations has also been raised for his benefit. In defiance of logic and geography, the pricing of coal from Ukrainian mines has been pegged to the Rotterdam Coal Futures index plus transport costs from Rotterdam to Ukraine. Akhmetov himself controls half of Opposition Bloc, the third largest fraction in parliament. He also had some influence on ex-PM Yatseniuk, whose removal from office was evidently OK’d by the oligarchs — Akhmetov’s energy interests were guaranteed during the transition period. The new Ukrainian government has also made no attempt to prosecute Dmytro Firtash, who is under investigation in the USA. He can’t travel anywhere outside Austria, where he now lives, without risking arrest under a warrant from the Illinois courts. Firtash and his business partner (and Côte d'Azur villa neighbour) Serhiy Lyovochkin still control deputies from Opposition Bloc and the Udar party of Kyiv’s mayor, former boxer Vitaly Klychko. The policy of deoligarchisation announced by Poroshenko a year ago has not been implemented. Instead, we have the beginnings of a ruling clan centred on the president himself, including his closest associate Ihor Kononenko, said to be in charge of energy and state owned companies, and his lawyer Oleksandr Granovsky, who is responsible for the judiciary and Prosecutor’s Office. Indeed, the Prosecutor’s Office has a new hands-on department that can initiate criminal cases against people who challenge the president in any way. One such group is the team of Mikheil Saakashvili, the former Georgian president appointed governor of the Odessa region in 2015, and a prominent anti-corruption figure. The Poroshenko group’s potential asset list includes major state owned companies such as the Odessa Port Plant chemical works, the Tsentrenergo power company, regional energy distributors and coal industry plants. It would, however, be unfair to describe Ukraine’s political landscape as beyond repair. The glass is more full than empty. As well as the inevitable oligarchs and kleptocrats, a group of young deputies has appeared for the first time in two decades. Ukraine differs from the countries of the Arab Spring in the sense that a whole group of civil society leaders — journalists, public figures, anti-corruption campaigners — decided to become parliamentary deputies after EuroMaidan. This provided the necessary impetus for change, both outside and inside the political system. 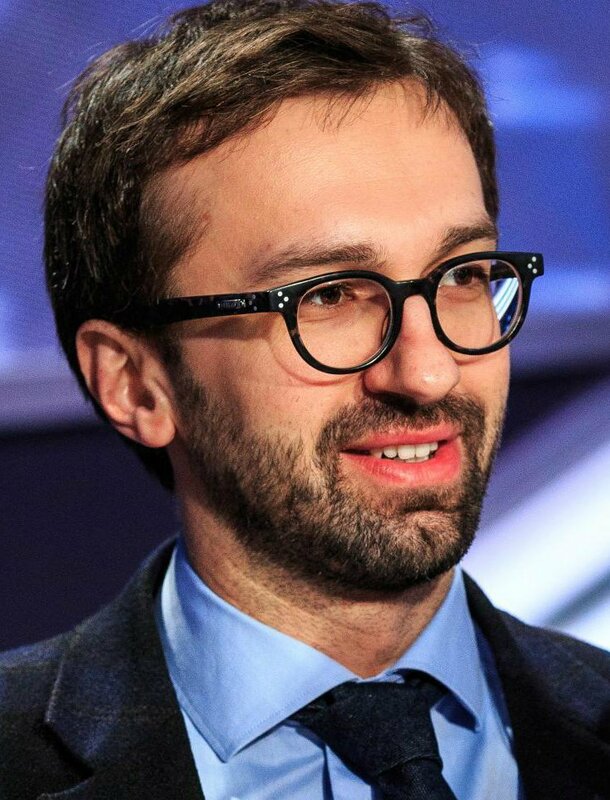 I myself became a member of parliament, as did my journalist colleague Mustafa Nayyem, whose Facebook posts triggered the anti-Yanukovych protests in November 2013. The civil society leaders who entered parliament banded together as a group of “Euro-optimists”, and the Anti-Corruption Platform was set up inside the presidential fraction. One of this group’s achievements was the passing of a law on combating political corruption that seeks to break the monopoly of the oligarchs on funding political parties by providing financial support out of public funds. Corruption is Ukrainians’ chief matter of concern: 47% of the population place it top of their list, although from time to time it is overtaken by the fighting in the east of the country. According to the latest surveys, 51% of Ukrainians today believe the authorities fought corruption more effectively under Yanukovych, but this is untrue. People’s expectations have risen, and the present government can’t satisfy their demands. Under Yanukovych, Ukrainians were prepared to turn a blind eye to a moderate amount of thieving, but now they demand zero tolerance on corruption. This week, the shocking scale of bribes paid out of the Party of Regions’ “black books” was revealed — Yanukovych’s former power base paid $60m in payoffs, illegal wages, services of PR consultants and TV time, and that’s only for the six months leading up to the 2012 parliamentary election. Much has changed since the Revolution of Dignity — corruption is no longer met with silence. Abuses of power are discussed on TV and in parliament. It’s cool to be an investigative journalist, and there are several anti-corruption programmes on state TV channels. There have been no high profile convictions yet, but the public mood is affecting politics. Parliament has become a forum for clashes of opinion. It reflects every population group in Ukraine. There are daily confrontations between “old” and “new” politicians; between “kleptocrats” and “reformers”; between democratic values and antediluvian corruption; between the oligarchs’ commodity-based economics and small business. So president Poroshenko is left with little choice. Either the war on corruption becomes part of his reforms, or Poroshenko’s hopes for a second term will be scuppered by his fellow Ukrainians. What do you think? Join us at the London School of Economics on 8 June for "Politics of Plunder" to discuss offshore practices, authoritarianism and the post-Crimea world order. Find more of openDemocracy's coverage here.